The “families” of Archbishop Joseph W. Tobin showed their pride, joy and excitement following the announcement that he had been chosen by Pope Francis on Oct. 9 to be one of the Church’s 17 new cardinals. The pride and joy started with his mother, Marie Tobin, for the oldest of her 13 children. Since her son decided to become a priest, she said, she has prayed for only one thing through the years—for him “to be a good priest.” She believes God has answered that prayer. 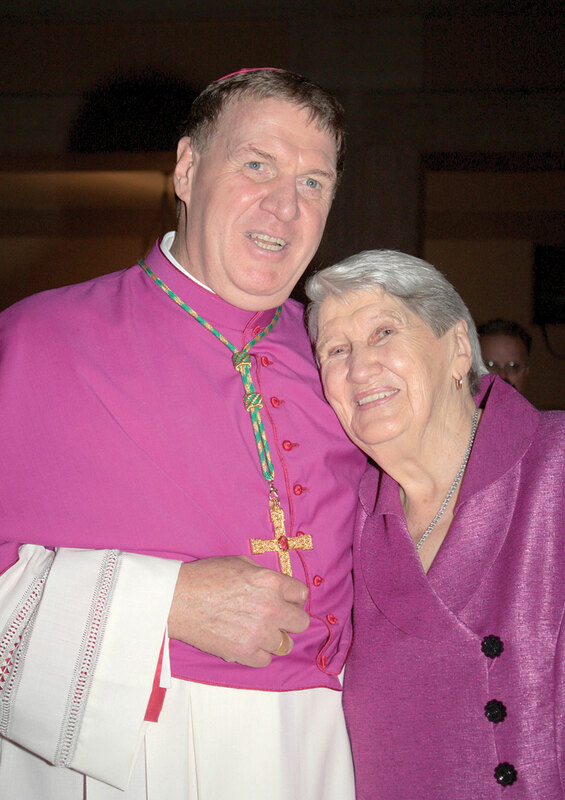 She’s also thankful to Pope Francis for leaving her son in the archdiocese, noting that Cardinal-designate Tobin has “left part of his heart” in every place where he’s ministered. “He so loves Indiana,” his mother said by phone from her home in Stoney Pointe, Ontario. “I would be afraid that he wouldn’t have heart left [if he had to leave.] I couldn’t imagine how sad he would be. She plans to travel to Rome for her son’s installation as a cardinal in St. Peter’s Basilica on Nov. 19. His sister Margo Tobin recalled their days of growing up together, including how they would play “Mass,” with Cardinal-designate Tobin being the priest and some of his sisters being the altar servers. “I always look back to that and marvel that he knew then [about his vocation],” she said from her home in Grosse Pointe Woods, Mich. Turning her thoughts to the pope’s selection of her brother as a cardinal, she added, “We’re so proud of him. I know he can handle anything the Holy Father puts him up to. “Having him in Indianapolis is wonderful for him and for us. Over the past few years, we have gotten to know and appreciate the people of the archdiocese who have welcomed him so. It’s a wonderful place for him to be. So is his brother, Jim Tobin. Praise and pride also came from another “family” of Cardinal-designate Tobin—the Redemptorists, the order in which he was ordained to the priesthood 38 years ago. He served as the superior general of the order from 1997 to 2009. The closeness between him and his order continues. The pope’s choice of Cardinal-designate Tobin also excited the family he has created in the archdiocese in his nearly four years as spiritual leader of the Church in central and southern Indiana. At 17, Caleb Moster was part of a group of high school students from southeastern Indiana who delayed a visit to the Bishop Simon Bruté Seminary in Indianapolis on Oct. 10 to attend the press conference for the new cardinal-designate in the Archbishop Edward T. O’Meara Catholic Center in Indianapolis. The group, who posed for photos and selfies with Cardinal-designate Tobin after the press conference, was led by Father Jonathan Meyer, pastor of All Saints Parish in Dearborn County. So does Father Kenneth Taylor, pastor of Holy Angels and St. Rita parishes, both in Indianapolis. The news created incredible excitement—and some initial concern—for Cardinal-designate Tobin’s close friend and colleague, Annette “Mickey” Lentz, chancellor of the archdiocese. “I was so happy and proud of him, and at the same time thinking, ‘Please don’t take him from us,’ ” Lentz said. After initially hearing the news, Msgr. William F. Stumpf, vicar general of the archdiocese, also wondered if Cardinal-designate Tobin was being assigned somewhere else. When he learned that the archbishop was staying with the archdiocese, he considered both pieces of news to be terrific. The pope’s choice is also great news for the young adults of the archdiocese, according to Katie Sahm, associate director of young adult and college campus ministry for the archdiocese. That enthusiasm was shared by Father Joseph Feltz, the archdiocese’s vice-chancellor and vicar for clergy, religious and parish life coordinators. Ken Ogorek, archdiocesan director of catechesis, agreed. “I was very happy to hear that someone as gifted as Archbishop Tobin will be an even closer collaborator with our Holy Father,” he said. Marian University president Daniel Elsener also praised the pope’s selection. The pope’s selection also thrilled Bishop Paul D. Etienne, the spiritual leader of the Diocese of Cheyenne, Wyo., who was recently chosen by Pope Francis to become the archbishop of Anchorage, Alaska. Archbishop-designate Etienne and Cardinal-designate Tobin talked by phone on the day that Pope Francis announced his new selections for cardinals. “It’s one more reason why I love Pope Francis,” said Archbishop-designate Etienne, who served as a priest in the Archdiocese of Indianapolis for 17 years. “He is picking pastors that embrace his vision of the Church. I can’t think of anyone that is more fully realizing the vision of Pope Francis in a local Church as Archbishop Tobin is. He is a humble man. He is an incredibly intelligent and wise man. And he’s just got his focus on other people all the time. Archbishop-designate Etienne also understands the pride and the excitement that people in the archdiocese are feeling, but he also encouraged people to consider more deeply what the pope’s selection of Cardinal-designate Tobin means. “Initially, there’s so much excitement in having your local bishop named a cardinal of the Church. But it’s important, once the excitement begins to settle down, that people look deeper to better understand what the Holy Father is communicating to us. And it’s service. He is choosing bishops that are engaged with all of God’s people, and take their role as servants of Christ and his Church very practically and seriously.